If you need a lawyer in Samui with international expertise and experience but also cost effective and reliable. Look no further than Siam Legal Samui where our branch manager, an Australian lawyer will be able to assist you with our other capable staff on the island of Koh Samui. Our law firm specializes in Real Estate transactions (Thailand property purchase, leasehold, condominium, villas, project development & licensing), Immigration (Thai Immigration, Citizenship, Permanent Residence, and Thai Business, Marriage and Retirement Visa applications), Tax and Accounting service, Litigation Services (Civil, Commercial and Criminal) and Investigation Services (Personal and Corporate). Our UK and US Immigration specialists supervise and handle our Thai Business Visa services. On the other hand, our licensed Thai lawyers and foreign attorneys and solicitors work together to offer sound legal advice and assistance with regard to Corporate & Investment Laws (including Foreign Business Law, Board of Investment – B.O.I, and Treaty of Amity). Call us today about your US Visa in Thailand or any other foreign visa you may need. You can also talk to us about getting married in Thailand and you marriage registration in Thailand today! 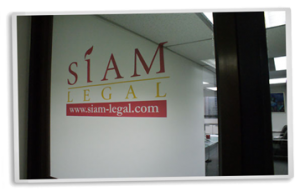 We are Thailand's largest legal services network. 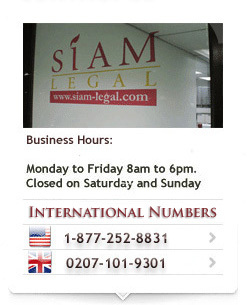 With law offices in Bangkok, Samui, Hua Hin, Phuket, Chiang Mai and Pattaya.